Part 5: Do they believe you can you help them? I’m not sure that most coaches realize that. But, the real art of the complimentary session is really found in what you do in the work before you ever sit down with the potential client. Besides making sure that the individual you’re giving the free session fits into your definition of an ideal client, there are 4 pre-qualifying questions that you should ask to help determine readiness. Last week, I gave you 2 of those pre-qualifying questions to help you determine timing. As you learned, timing comes from whether or not the potential client has reached critical mass with their strong desire. If, on a scale of 1-10 (with 10 being the highest), the potential client is at an 8 or higher, then that means the desire is so urgent, they must do something now. But the next pre-qualifying question is really going to center on whether or not coaching is the vehicle to getting them where they want to go, or, more specifically, if they believe you can help them achieve their goal. On a scale of 1-10 (with 10 being the highest), how convinced are you that I can help you achieve your goal? This is a very powerful pre-qualifying question that I use when potential clients already know me or have been referred to me by others they trust. I ask this question before we schedule the complimentary session and before they’ve ever experienced my coaching. The way I see it, the complimentary session is going to solidify what they already believe, but I want to ensure that they have all but made up their mind before I schedule them for a session. You might be asking yourself: Well, how can they be so certain if they haven’t actually experienced your coaching before? That’s easy. And it’s goes back to the pyramid that I showed you previously. 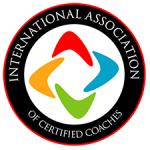 An individual hires a coach primarily out of trust, secondarily out of likability, and, lastly, because the coach has shown a certain level of expertise to help them with their problem. Maybe this potential client hasn’t experienced my coaching, but I have been doing the things that develop trust and likability. This happens long before the complimentary session, and any coach can do it. 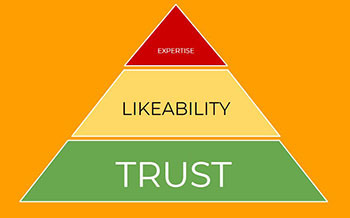 You should be consistently planting seeds of trust and likability in your network of people. Many of your clients aren’t going to come from people you’ve known a really long time. Often, the people who want your service have been referred to you by people who already know you and can vouch for you. The people who vouch for you aren’t necessarily past client. All you need for trust and likability to be established is a good reputation. So, again, if someone contacts me to inquire about a complimentary session, I want to know they truly believe I can help them. He stopped everything, pulled up a chair, and shared his heart. I’d found his hot button, and he spilled his guts. It was one conversation. I’d never even coached the guy, and he was already convinced I could help him. That meant all I really needed to do was use the complimentary session to assure him that he was right. If I’m able to demonstrate to you that I can help you take steps to accomplish your goal, on a scale of 1-10, how likely are you to start a coaching relationship with me? This is yet another powerful pre-qualifying question, and you can use this one when the potential client doesn’t know you as well. A lot of coaches will shy away from this question, because they’re afraid it will scare away a potential client, but that’s not the case at all. If this question would scare someone away, then this individual was never going to become a client in the first place. If this question would scare someone away, then the individual was never going to become a client in the first place. You’d rather this person be discouraged from taking a free session with you than for you to get your hopes up by giving them a session, only to find yourself to be disappointed when they don’t sign. There’s still nothing for the potential client to lose. It’s a no-strings attached session with you. But you have managed to build the value and curiosity with this sort of question. Now they’re expecting you to give them a powerful experience, and if you don’t deliver, well…that’s the reason they can give you for why they don’t work with you. At the same time, this question eliminates anyone who’s wishy-washy – anyone who’s really not that serious about working with a coach. For this pre-qualifying question, you’re looking for someone who gives you an “8” or higher. That means, they are pretty much “pre-convinced” they want to work with you. All you have to do is deliver the goods. I’ve personally never been given a number less than 10 when I asked this pre-qualifying question. As a result, I really never get a “No” from potential clients whenever they get a free session from me. Pre-qualifiers do the work of filtering out people who simply aren’t ready right now. They might be ready later, but there’s no sense in giving them a free session if the timing isn’t right. Next week, I’m going to share pre-qualifying question #4. In the meantime, please use the links in the author bio section to interact with us on social media. And Share! Share! Share! this article with others that could really benefit from it!